The South Lopham Parish Council Risk Management Policy is published for transparency. The external Audit of accounts for the Financial Year up to 31 March 2015 has been concluded. The Annual Return and Audit findings are available for inspection by any Elector of South Lopham Parish on application to the Parish Clerk. Copies of the Return can be requested for a fee of £3 to cover copying costs payable to South Lopham Parish Council. The external Audit of accounts for the Financial Year up to 31 March 2014 has been concluded. The Annual Return and Audit findings are available for inspection by any Elector of South Lopham Parish on application to the Parish Clerk. Copies of the Return can be requested for a fee of £3 to cover copying costs payable to South Lopham Parish Council. The external Audit of accounts for the Financial Year up to 31 March 2013 has been concluded. The Annual Return and Audit findings are available for inspection by any Elector of South Lopham Parish on application to the Parish Clerk. Copies of the Return can be requested for a fee of £2 to cover copying costs payable to South Lopham Parish Council. 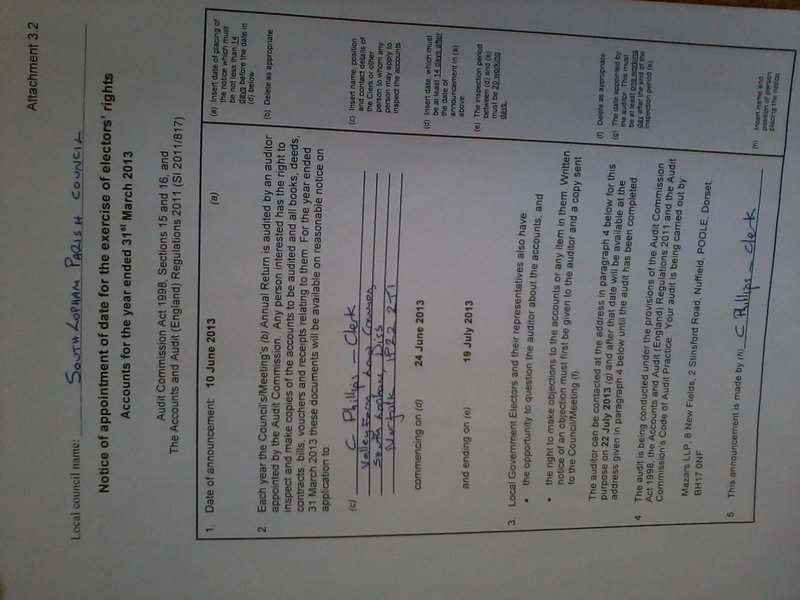 In accordance with the provisions of the Audit Commission Act 1998 and the Accounts and Audit (England) Regulations 2011 notice is hereby given that the accounts and audit return for South Lopham Parish Council for the financial year 2012/13 are available for inspection. Any person interested has the right to inspect and make copies of the accounts to be audited and all books, deeds, contracts, bills, vouchers and receipts relating to them. They are available on reasonable notice from the Parish Clerk, Mrs Caroline Phillips between 24 June 2013 to 19 July 2013. A copy of the official notification document, posted on the parish noticeboard is available here (opens in new window). 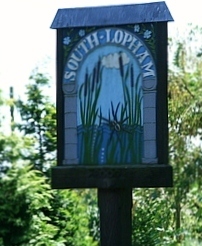 The annual external audit of South Lopham Parish Council accounts for the financial year 2011/12 has recently been completed. A PDF copy of the audit report is available here for public inspection (PDF document opens in a new window). In accordance with Audit Commission requirements the annual accounts of South Lopham Parish Council for the Financial Year 2011/12 are available for public viewing by appointment until 24 July 2012. Any member of the public wishing to view the accounts should contact the Parish Clerk.